Opening reception on Thursday 12 December 2013, 6:30 pm. Live Performances by Artists from 7:30 pm. A new exhibition about conceptual approaches to making art for, with, and about the collective and collective issues in Southeast Asia. Celebrating ASEAN integration commencing in 2015, BACC is proudly presenting a new and specially BACC-commissioned exhibition of regional contemporary visual art, the biggest ever Southeast Asian contemporary art show produced in Thailand Concept Context Contestation: art and the collective in Southeast Asia. With nearly 50 artworks by over 40 celebrated internationally-known Southeast Asian artists of three generations from eight countries; Thailand Sutee Kunavichayanont, Vasan Sitthiket, Manit Sriwanichpoom and new generation artists; Indonesia FX Harsono, Eko Nugroho and Daging Tumbuh and Popok Tri Wahyudi; Philippines Imelda Cajipe Endaya and Alwin Reamillo; Vietnam Vu Dan Tan; Malaysia Simryn Gill and Wong Hoy Cheong; Singapore Amanda Heng and Lee Wen; Burma and Cambodia, the show will chart one of regional contemporary art’s most important threads, locally-rooted conceptual thinking used to engage in ideas about and for the collective. It will investigate the close connection between conceptual approaches and social ideologies in Southeast Asian contemporary art of the last four decades and will offer art historical insights into our own regional visual culture of today. The exhibition will defend the idea that conceptual approaches used in contemporary art of Southeast Asia are not necessarily imported but rather can find their source in home culture. 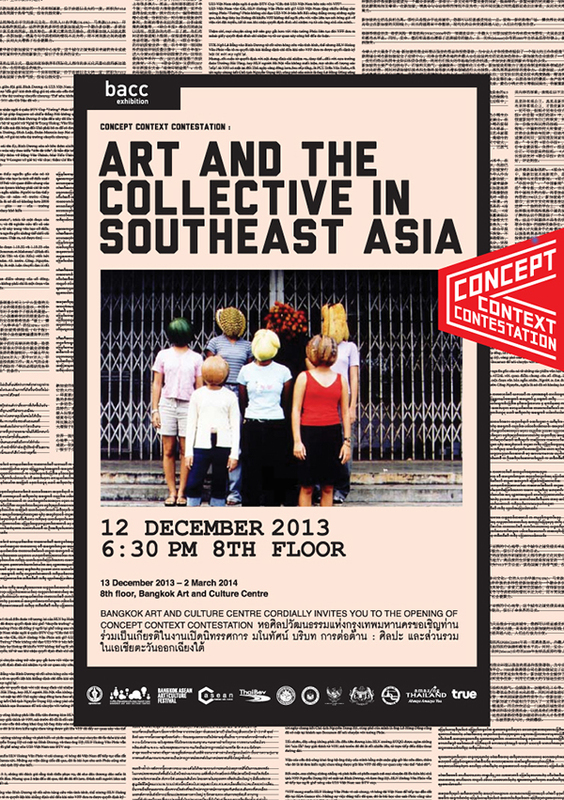 Concept Context Contestation: art and the collective in Southeast Asia will be documented by a fully-illustrated ten-essay research catalogue by the curators and other specialists and will also feature a weekend of free public educational talks and panel discussions by experts in the field. The show will present media of all types including interactive forms designed to stimulate public engagement and create dynamic dialogue along the journey. Thus repeated visits can yield a different experience each time, so fully illustrating the way in which Southeast Asian contemporary art and life mesh.